Some 30 crore plants were geo-tagged which led more accountability to the scheme. The plantation drive was conducted in mid-July this year after the experience of the previous year when heavy showers in October took the forest department by surprise. This was a good decision, said forest officials. “We wanted to ensure against a dry spell after the initial rains as had happened in the first two phases,” said Mr Sudhakar Reddy, assistant conservator of forests (ASF). “The saplings this time were quite strong enough to survive any unexpected showers. We still have a to do a lot to increase the forest cover from the existing 24 per cent to the desired 33 per cent,” he said. “At the end of the five phases of Haritha Haram there will surely be a substantial increase in the tree cover,”Mr Sudhakar Reddy added. The success rate of avenue plantations has inspired the forest department to replicate the method in urban municipalities in the fourth phase in 2018. “We have seen a 90 per cent success rate in avenue plantations because of regular watering by HMDA and other official agencies. So it is important that we invest more on it in 2018,” said Mr Dobriyal. Officials, however, said that the lack of citizen participation became evidently clear in the third phase. “It is easy to blame the government, but citizens too should do their bit. 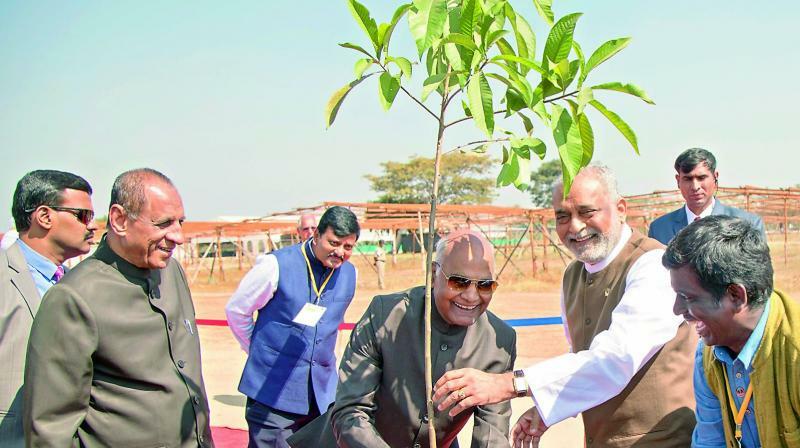 They should actively participate in sapling planting. We are planning to plant 44 crore saplings in the fourth phase in 2018,” said deputy conservator of forests (DCF) Mr Srinivas Rao. Over 3,000 nurseries — 80 more than earlier — will be handed the responsibility of nurturing saplings for the fourth phase of Haritha Haram. A major initiative undertaken in the third phase was the geo tagging of plants. Some 30 crore plants were geo-tagged which led more accountability to the scheme. “About 90 per cent of the plants have been geo-tagged in 32 districts, with Medchal, Khammam, Jangoan, Nizamabad and Nalgonda topping the list with nearly 100 per cent geo-tagging,” said Mr Srinivas Rao. Any area noticed with less than 70 per cent survival rate by mid-March will be given special attention in the fourth phase, he said.